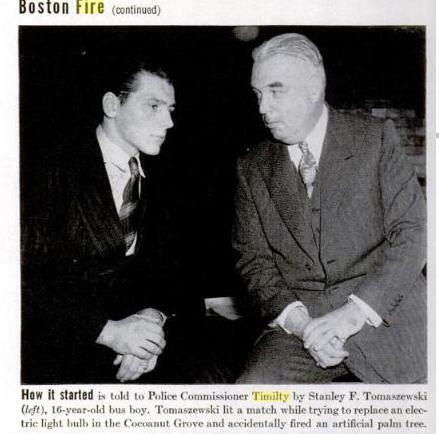 On his death-bed, Stanley Tomaszewski swore that he had not started the fire at the Cocoanut Grove in 1942. Now it is probably just a coincidence that Commissioner Timilty was in the club at the time of the fire and practically lived with the Kennedys then, and that Jack Kennedy requested to be sent overseas the next day after the fire, even though he was excited about the impending arrival of his old school chum Lem at Melville, but what do you make of Bernard Baruch’s (another of Inga Arvad’s lovers) sudden burst of generosity to donate a million dollars to Army and Navy service groups that Christmas, or the fact that a fortnight later a similar fire occurred in St. Johns, Newfoundland, a fire that was attributed to agents of Nazi Germany? Did I mention that Bernard Baruch was calling Inga every morning at 7:30, and she called him “my old goat”?